The Bible edition in this study Bible is the Holman Christian Standard Bible (HCSB), a good English translation. This FREE offer is only available today, 4/1. 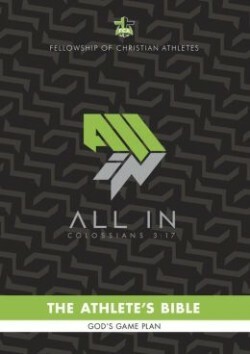 All–in is the 2014 FCA camp theme. A sold-out athlete never wavers in competition. A sold-out athlete doesn’t look back. A sold-out athlete is consumed by a single goal. When an athlete is All-In in body, mind and spirit there are no limits on what he or she can accomplish! The FCA Athlete’s Study Bible is created for competitors on the professional, college, high school, junior high, and youth levels. Featuring 232 pages of exclusive FCA content, this Study Bible is full of amazing tools to help equip, encourage, and empower athletes in any sport to study God’s Word. Includes: FCA Camp Meeting Material, Training Time devotionals, Warm-Up Studies, Athlete Studies, the Starting Line Devotional and the More Than Winning Gospel presentation.